No matter how you look at it, maintaining a lush, manicured lawn takes time and money. Did you know that on average, 70% of your water bill comes from watering your lawn? Why waste precious weekend hours mowing, fertilizing, and watering your lawn or spend your hard-earned money on gardeners to maintain it? 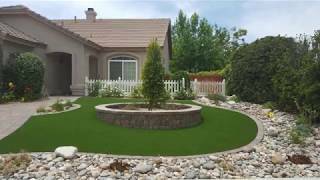 Let Landmark Pavers free up your weekends and save you money on lawn care with an artificial turf installation. Request a Quote to set up a free consultation today!